This is really time-consuming to withdraw cash from a bank's ATM for the payment every now & then. Now is the time for digital transactions. If you are using Paytm Wallet, you can be sure that it has big features. Paytm wallet is designed specially to pay in the easiest possible way. You can make payments on the move, initiate immediate money transfers and request money. By using Paytm wallet, you can pay at restaurants, for cabs, bus tickets and even at your local Kirana store. You can easily pay at any of these outlets in seconds and then there is no need for cash. Paytem has developed Paytm wallet just for this purpose. You just need to add money to Paytm wallet. You can make payment using Paytm website as well as Paytm App, both works at a fast speed and you just need 2-3 clicks to do the transaction. Paytm is accepted at lakhs of stores & shops across India. While doing the digital transaction via Paytm, you are helping India become a digital economy. Just #PaytmKaro. 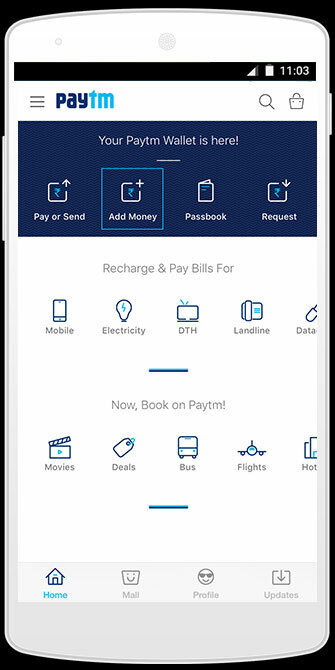 Add money to Paytm Wallet from anytime and anywhere with superfast speed. From time to time, Paytm provides special promo codes to add money to paytm wallet offers. These add money to paytm wallet offers would give you cashback in your paytm wallet account. Paytm allows you to add upto Rs. 10,000 per month in the paytm wallet and if this monthly limit is somewhat less for you, contact Paytm, get your KYC (Know Your Customer) process done for unlimited usage. Here we have given a step by step procedure on How to add money in Paytm wallet? You will see a 'Success' message once your transaction is complete. The amount you added in your paytm wallet will be credited instantly and you can see the same in your wallet. Paytm also sends an instant update on your registered e-mail id and mobile number about the transaction. Now you get to know how to add money to Paytm Wallet. Read here on How to Send Money from Paytm?